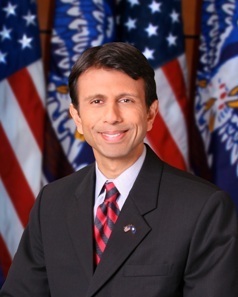 Bobby Jindal was sworn in as Governor of Louisiana on January 14, 2008. He led the historic response to Hurricane Gustav by successfully moving 1.9 million people out of harms’ way, the largest evacuation of citizens in the history of the United States, including the largest medical evacuation in history moving more than 10,400 people from hospitals, nursing homes, and other medical facilities out of the path of the storm. Jindal graduated from Baton Rouge High School in 1988 and went on to attend Brown University where he graduated with honors in biology and public policy. Following his graduation from Brown he attended Oxford University in England as a Rhodes Scholar. In 1994, Jindal went to work for McKinsey and Company as a consultant for Fortune 500 companies before entering public service. In 1996, he was appointed Secretary of the Louisiana Department of Health and Hospitals (DHH). In 1998, Jindal was appointed Executive Director of the National Bipartisan Commission on the Future of Medicare. President George W. Bush appointed Jindal to serve as Assistant Secretary for the U.S. Department of Health and Human Services in 2001. In that position, he served as the principal policy advisor to the Secretary of Health and Human Services In 2004 he was elected to the 109th United States Congress representing the First District of Louisiana. In Congress he was elected Freshman Class President and served on the House Committee on Education and the Workforce, the House Committee on Homeland Security, and the House Committee on Resources. Bobby also served as Assistant Majority Whip. Jindal was re-elected to Congress in 2006.